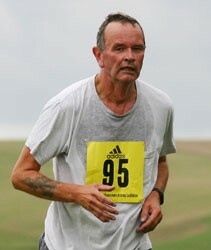 When I first ran this race in 2005 the Reebok Brighton 10k. That will be as meaningful to younger runners as telling them is was sponsored by Will’s Whiffs or Pear’s Soap. The chart below shows. in general, decline and fall, though note that I picked up speed a little this year, finishing in two minutes less than last year. The race becomes bigger and bigger, and this year stayed on the A259, rather than the promenade, thanks to the building works for Brighton’s i360. This was a mixed blessing. It may have helped the front of the field go faster, unimpeded by bollards and ill-disciplined dog-walkers, but further back in the race, without any clear division between those running out and those running back, and without firm marshalling, it was nightmarish. The blame, though, lies with my fellow runners, particularly those who clamp headphones on their ears and pay no attention to the outside world. Nevertheless, it was a good run. I went off too fast, and paid for this at the end, when I had very little left for the last kilometre. Still, I took some pleasure in overtaking a particularly annoying oaf with the world’s biggest headphones on. ‘Why should that stop you running, Roper? You don’t run with your hands, boy! 'In my defence, sir, the injury made me indolent, I felt as if not just my epidermis but my very soul had been torn from me’. And so on…I was back to my schooldays. My wrist is healing, and last Wednesday I managed a bit of a club run with the Seaford Striders. I lasted for two miles before I threw in the towel. On Sunday I decided to attempt four miles over Seaford Head. And, oh, the weather. I left it till four o’clock to run, by which time it was crepuscular, a winter Sunday afternoon when we would drive across the fens to Ely for crumpets with great-aunt Ada. Up onto Seaford Head, down to Hope Gap and up again. When I reached the top, it was as if I had plodded into a Turner canvas, a boiling sea, huge clouds, black, grey, navy blue, and, the oddest thing, a sudden flash of pink above me as the setting sun struck some clouds thousands of feet above me. If J.M.W Turner were with me, he would have had himself lashed to a tree ignored to paint me.